Before me stands a black-and-white photograph of hands. A pair of female hands rests upon a larger, rougher male hand. And nestled inside is another hand -- pale, tiny, lifeless. "People think, 'Oh, it's so wonderful!' when you tell them ... that you work in Labor & Delivery. That's the fun, happy place to be. And it is," says Moni Taylor, tossing her long, ash-blond hair over her shoulder. "But it's also the saddest. When you're an L&D nurse, you can be living the saddest of times in the happiest of places. It's got the extremes of everything -- the births as well as the babies who don't make it." Taylor is perched on my couch, her slender, blue-jean-clad legs tucked up under her, a cup of tea by her side. She expresses herself passionately in rapid-fire, run-on sentences. And with every utterance, her hands spring into action like a pair of eager marionettes. On the coffee table between us lie pages from her forthcoming book, The Time Between: Reflections of an L&D Nurse. For the past 14 years, Taylor's been a nurse at Mission Hospitals in Asheville. Each year, more than 3,500 babies are born in Mission's 15 labor-and-delivery rooms. And as a level III neonatal intensive-care unit, it's the go-to place for at-risk babies in Western North Carolina. But Taylor is also a professional photographer. In her free time, she captures her fellow Ashevilleans in whimsical, nonstudio environments. And several times a year, those two vocations come together in the quietest rooms at Mission -- the ones reserved for women pregnant with what the medical community calls a "fetal demise" (a baby who has died in utero or who isn't expected to survive more than a day or two past birth). Fully 35 times in the past seven years, for the saddest of reasons, Moni the nurse has been asked to become Moni the photographer. And what makes her so unusual is the profound empathy and resilience she brings to these poignant moments. Other nurses photograph only the baby, just for the record, she notes. "But I've always been drawn to photograph the entire family -- that beautiful cocoon, that collective spirit of a family that was created, even if just for a short while. Of course I'm photographing the emotion, the intensity of how we deal with these moments, the deep loss of that future dream. But we can see the whole thing [only] when you photograph the family." "I once had a teenage couple with a demise," Taylor recalls. "The girl was only 15 or maybe 16. He was 18 with tattoos, earrings, all that kind of stuff. I was overwhelmed at the maturity that blossomed in that moment when they realized the baby was not going to make it. That look of 'Oh my God, this is real, this is real!' They took their baby and dressed it. And this 18-year-old boy just took that little baby and held it, and I was overwhelmed. They'll never be the same, and it's a good thing. This is just a profound moment of change. "There's that magic moment: Is it going to happen? That little sliver of space where you just don't know. Will the baby make the transition from living inside with mom to living by itself outside? It's a little magic line -- will it come together, or will it change your life forever? "It always does, with birth. Even if everything is perfect, you still have been changed. ... Your skin's been changed, everything's different. And you're different. There's an instant maturity of knowledge. People get a light-year's worth of experience in that moment." Many might understandably shy away from witnessing such sadness and despair, but Moni emphasizes again and again what an honor she feels it is to be a part of a "space in time" that is, as author/priest Henri Nouwen describes it, "arrival and departure ... yesterday and today ... all compressed in one blink of an eye." 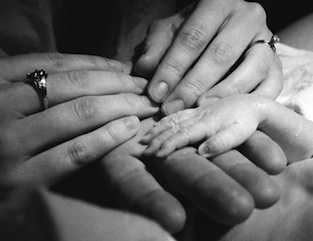 And for Taylor, that eye is the camera's, giving her a chance to pay tribute not only to this tiniest sliver of a life, but also to the parents -- capturing a fleeting family tableau that will soon exist nowhere else except, perhaps, in memory. It took a long, lonely journey to bring Taylor to this remarkable perspective. For years after becoming a nurse, she went out of her way to avoid fetal-demise deliveries. Having lost her own first baby in 1976, the pain of seeing others go through same experience was simply unbearable. "Even many years later, it was still too fresh to what I'd already gone through," Taylor recalls. When she first discovered she was pregnant, "I was so thrilled I announced it to everybody in the waiting room!" she says with a big smile. But her joy proved short-lived. "My water broke at work one day, and I was just devastated. I was only 20 weeks pregnant, and I knew what was going to happen. I was just the saddest person on the planet.... The doctor told me straight up that it was over. He did a D&C (dilation and curettage) and removed the baby, put it in a pan and covered it up with a towel. And I never got to see it; I didn't know what it was.... I just got up and went home....And it was just a heartbreaker to have it so casually cared for. I just remember that hollow feeling of having nothing...nothing! "It was something that had never been resolved in me. I see that in older women that I talk to, and when they get brave and say something about (a baby they lost), it's the first time someone has let them talk about it. It's a gift for them to even have air for the words to live in for a few minutes. Because nobody wants to listen; it's too uncomfortable. "And so I try very hard to make sure people have as much information as possible, to honor the baby for them, no matter how itty it is. It's the dream and the future that's lost – all that future thought that makes us get up in the morning and get going – there's some thing to work on and dreams to work out. You have to drop out when those dreams are over. And it takes huge energy to even begin again after that, because it's just draining to start over. That's why I try to be tender with all my patients." But Taylor's pattern of avoidance hit a brick wall when the unthinkable happened. Kelly, her friend and colleague at Mission, was 37 weeks pregnant. One morning she realized she was no longer feeling any movement from the baby. "Our very own Kelly," Taylor writes in her book. "The department was stunned.... She helps deliver babies for a living! We couldn't believe it." 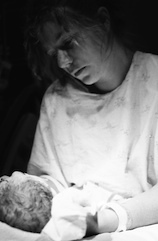 Kelly had already asked Taylor to photograph her baby's birth. And after she's received confirmation that she was carrying a fetal demise, she told Taylor she still wanted her to be there, with her camera. "What do you photographs mean to these families?" I ask Taylor as she pauses for a sip of tea. Without hesitation, she pounces on the question. "The families treasure these pictures; they treasure them! she exclaims. "Photographs are the physical connection for the family: a photograph gives them something to touch and hold." The baby, notes Taylor, "has no physical history to leave with the family, We don't have stuff they lived with and touched, things that give witness to them being here. The photographs give witness." In Taylor's haunting images, the babies and their parents look like sculpture: two-dimensional friezes that seem chiseled out of raw emotion. I ask her why she chooses to shoot in black and white, and immediately her hands begin flying again. 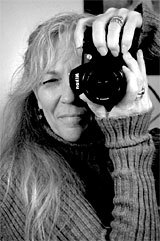 "When you photograph in color," she explains, her fingers framing an imaginary scene, "you have introduced another element. The color starts to fight for attention and is a distraction. It's OK when you're shooting color subjects, like fashion or flowers. 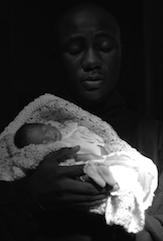 [But] I don't want anything to distract from the subject of the photo: the baby and the spirit. The only way to capture that is to eliminate all other distractions and give it its space. Besides," she adds thoughtfully, "the babies don't always look good in color, they don't look right. And I want to give the parents a good memory to keep." Besides her own writing, Taylor has incorporated the moving words of other bereaved mothers in her book. "[It] seems like a hundred years ago and one second ago," Kelly writes to the baby she lost. "If looking at pictures would wear them out, yours would be threadbare. I have looked at them a million times." But the key to Taylor's photography is her conviction that the length of a life cannot define the value of it. "All we have is our connection to other people and our moments with them, and saving those moments is what it's all about," she proclaims. "Otherwise, all of the things that w surround ourselves with, and all of our possessions, are worthless." "I have been profoundly affected by people who come into my life for moments.... Especially these itty ones that chose to spend time with us and give us more realization about the realness and the importance of any time that we spend here. Sometimes they're there forever, and that's good. And then some blow through like a little whiff, and it's sweet. Those moments are profound, and that's where we become rich." 2001 data (the more recent available) from the National Center for Health Statistics shows a U.S. fetal-mortality rate of 6.5 per 1,000 births. These tiny deaths occur for a variety of reasons, but whatever the medical explanation, the parents are inevitably left with a single, burning question that is at once simpler and infinitely more complex. "There's never an answer to 'Why?'" Taylor declares, her narrowed eyes challenging me with the intensity of a focused beam of light. "'Why?' is always an unanswered question when it applies to the body or the spirit. "We can always say, 'How?' – it's OK to ask, 'How?' – 'How' is human. But," she pauses and her voice drops to a whisper, "'Why?' is so divine and can only be answered divinely... So to even think we can answer [it] right away is unrealistic, inappropriate. We're a myriad of the stuff that comes into and and shapes and creates us day to day. And we may not know the answers to 'Why?' until much further down the road." Answers aside, she continues, "There are lots of changes in life, but this one is highly private... I feel highly privileged to be at that sliver moment in people's lives. "Other times I think it would be nice to not be so intense and just have a regular job." Taylor pauses and laughs, but only briefly. "It's a sweet honor," she says softly.